"After much deliberation and sorting through best pet advice sites on the internet, we are happy to announce the winners of the Pets At Home Pawfection Award 2012! We are pleased to announce that http://www.herpetofauna.co.uk/ has been selected as the winning site for the other reptile category! The judges made particular reference to your identification section. As a Pawfection winner, you will receive £100 of Pets At Home vouchers as well as a mention and link from the Pets At Home website." This is obviously a great surprise and excellent news, particularly as it will help defer the costs of running the forum (not that Pets at Home sell anything for the forum, but they do sell supplies that we can use thus releasing money to pay for the website). So, many thanks to whoever nominated us and, of course, to Pets at Home! I am pleased to say that I have now managed to recover ALL of the missing authors and threads following on from the attack on, and collapse of the original website. Unfortunately, the database was so corrupted that it did not prove possible to import them into the new Forum. As a result you will now see a new menu option "Archived Forums". This leads to a basic snapshot of the forum as it was at 29th March 2011. It IS basic, there is no posting and navigation is somewhat simplified but hopefully fully usable. I am particularly pleased as the "lost" members, and their posts, included people like David Bird and Caleb - long time valued contributors to the forum. In due course some of the older topics (i.e. those without posts for the last 3+ years) will also be transferred to the new archive thus saving precious and expensive space on the new server. The corruption of the old MS Access database led to a loss of data integrity which in turn meant that the table relationships were completely ineffective. While it is probably technically possible to restore the missing data to the new forum it was simply not practical. Accordingly the data was exported to MySQL and a new "read only" forum created reading that data using PHP. 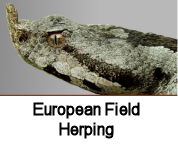 WILDguide publications have released an exciting new book about our native herpetofauna. Authored by Howard Inns, who many of you will know, it has probably the finest selection of photographs, including alien species, ever accumulated in a single volume. For more details click here for a Word leaflet or here for a PDF. RAUK would like, on behalf of all its members, to acknowledge the assistance of Amphibian and Reptile Conservation (ARC) and the Amphibian and Reptile Groups of the UK (ARG UK) who have kindly sponsored this site. These two key organisations recognise the importance of a totally independent forum in which those interested in our herpetofauna in the field and its conservation can freely exchange news, advice and opinions. As a result of their financial support, RAUK can now to look forward to continuing, and growing, for the foreseeable future. Both of these organisations can themselves benefit from your support. You can become a ‘Frog Friend’ of Amphibian and Reptile Conservation, to support and find out about its herpetofauna conservation work www.arc-trust.org. The Great Easter Newt Hunt. ARC and ARG-UK have worked together to produce this - a survey of newts in garden ponds at the height of their breeding season. Spread the word, encourage anyone and everyone to participate. A record is a description of WHAT was seen, WHEN it was seen and WHERE. It is also useful to know WHO saw the animal so that we can follow up reports of endangered species and verify records. Reptiles & Amphibians of the UK have provided an on-line submission form to make the process of telling us about what you have seen as straightforward as possible. The form requires a valid email address as our reference of who submitted the record.